Qualifying as a nurse opens up a wide and diverse range of career paths. However, the selection criteria will be quite rigorous and you need to show that you fit the bill. With this in mind, your personal statement should demonstrate a clear understanding of what the role involves, the challenges you’ll face and the kind of skills, qualities and values required. 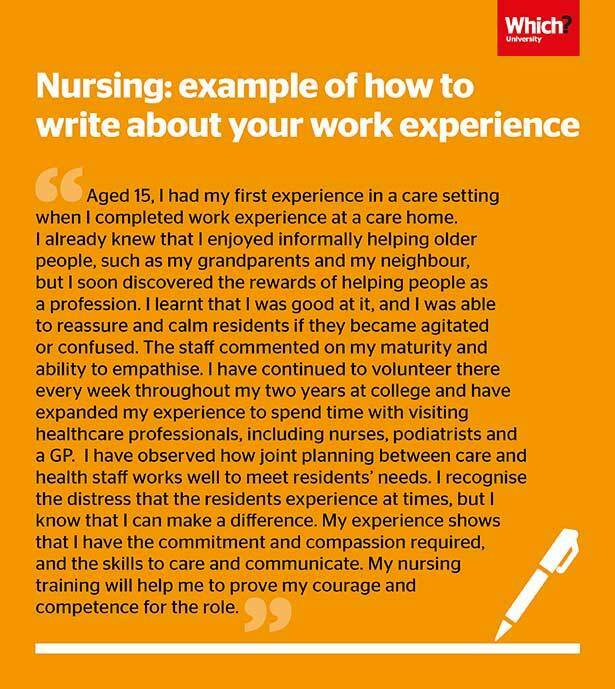 We've asked admissions tutors to share their top dos and don'ts for nursing personal statements, and asked a careers adviser to create an example of how to write about your work experience – here's what they told us. Anything you feel is especially relevant about your academic studies or maybe a project you've undertaken. Some universities will score your personal statement against their specific selection criteria – so make sure you take a look at individual university websites, as these criteria may be listed for you to refer to. You can also look up nursing courses here on Which? University. Try to build up as much experience or observation as you can. Ideally this should be in a care environment, such as a hospital, clinic, GP practice, school, residential care or the voluntary sector. Any other experience of working with people is helpful too. Back up these experiences by carrying out some relevant background reading or research - Health Careers is a good starting point. Just talking to nurses about their work will also be valuable. And, if possible, get to some university open days, as they’re great for picking up new insights and asking questions. Read about male nurse Ewout's route into nursing where he shares his tips on how to apply for a nursing course. How you’ve demonstrated some of those skills, qualities and values yourself through your experience, extracurricular activities, personal interests or achievements. The latter could include the responsibility and commitment you’ve shown through voluntary work; the teamwork and interpersonal skills you’ve developed in your part-time job; the empathy you’ve shown as a student mentor; the leadership you’ve displayed as a Guide or Scout or something specific that happened on a Duke of Edinburgh’s Award expedition, and so on. TIP: Don’t waste space in your statement explaining what a nurse does – they know that! But if you’ve found out for yourself how nurses manage, prescribe, evaluate or critically review evidence when making decisions, do reflect on that. We know it can be difficult to articulate your experiences on paper, so we worked up an example with careers adviser Cerys Evans as a source of inspiration. Find more examples of how to write a personal statement, how to create the perfect beginning and ending to your personal statement. Most nursing admissions tutors expect you to apply for one specific field only, such as adult or child. They'll expect you to choose between nursing and midwifery courses rather than apply to both at the same time. However, one university told us that you wouldn’t automatically be rejected if you are genuinely interested in the crossover between two different fields (same for nursing and midwifery); so do check first. Some universities also offer dual-field courses but you'll need to demonstrate a realistic understanding of the field(s) you’ve chosen. For example, if you’re applying specifically for mental health nursing, you might want to reflect on your ability to understand other people’s perspectives or to advocate on their behalf. Or if you feel it’s appropriate to reflect on your own experience of mental health then, as one admissions tutor told us, the key is to explain how this has motivated you to become a nurse yourself. For child nursing, you might wish to demonstrate your awareness of the diverse range of children you will nurse and the kind of challenges you expect to face. Similarly, for adult or learning disability, you could reflect on what you’ve learned from your interactions with elderly people or how you’ve supported someone with a learning disability yourself. The key words are ‘demonstrate’ and ‘reflect’. It’s not enough just to say you understand something; you need to show what it was that led to your understanding. Then, as Moira Davies, nursing admissions tutor at University of South Wales advises, ‘highlight the skills you have that are transferable to the field of nursing you have chosen’. If you’re interested in learning more about how to write a personal statement for midwifery, read our guide. Nursing has changed and diversified in recent years. So do your research, show your unique insights into the role and don’t make any spelling mistakes. For a nurse, accuracy is vital. For all degree courses that involve training within an NHS setting, there is likely to be some emphasis on values based selection, and how applicants' own values and behaviours align with the seven core values of the NHS Constitution. Familiarise yourself with this while writing your personal statement. 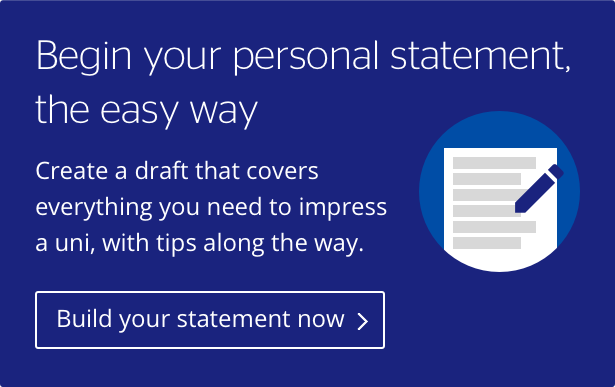 For more personal statement advice and examples, see our articles on how to write a personal statement, 10 things to include and our video tips from tutors (featuring a computer science professor from the University of Warwick...). You can also compare computer science courses here.